Discover the unspoilt scenery, cobbled towns and traditional churches of the Greek Islands which were used to film scenes from the beloved movie Mamma Mia. Sail to the beautiful Turkish coast, where the coastal resort of Dikili is the gateway to the ancient Pergamon ruins. Discover Myrina's Genoese castle and neoclassical mansions on a call at the island of Limnos then see where some scenes from Mamma Mia were filmed on Skiathos and relax on the sandy beaches. Get a glimpse of local Greek life on Skopelos whose unspoilt scenery also formed the backdrop to the Mamma Mia film. Admire the pastel-coloured houses of Poros Town and snorkel in the emerald waters. Embark Star Flyer in Piraeus. The coastal resort of Dikili is the gateway to the UNESCO-listed ancient Pergamon ruins. These magnificent remnants date back to 197-159 BC and include the Hellenistic Theatre, the Sanctuary of Trajan and the Library. Myrina village is home to two beautiful bays, an impressive Venetian castle and old neoclassical mansions. Perhaps visit the beautiful church of Panagia Kokoviotissa, perched at the top of a cliff, or the prehistoric settlement of Myrina. 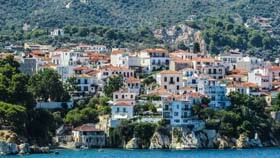 Discover the island of Skiathos, where some scenes from Mamma Mia were filmed. Relax on the pine-fringed sandy beaches or snorkel in the azure sea. Get a taste of traditional Greece with a call at Skopelos, a favourite with Greek locals. The unspoilt scenery of Skopelos was used in Mamma Mia, including the beach at Kastani Bay, Nisi Glisteri clifftop and Agios Ioannis Prodromos Monastery where the famous wedding scene was filmed. The pastel-coloured houses of Poros Town climb up the hillside to a beautiful neoclassical clock tower. Love Bay Beach is surrounded by pine forests and is perfect for relaxing on the beach or snorkelling in the amazing emerald waters. Disembark Star Flyer in Piraeus.